If you needed any further evidence of just how boss Country Music Hall of Famer Alan Jackson is, appreciate that on his upcoming 2019 tour, instead of sifting through the usual cast of major label characters in search for openers, he’s delved deep into the well of undiscovered country music talent, and come up with multiple worthy names who deserve their fair shot on a huge stage. Principal support on the upcoming tour will be mainstream country music revivalist William Michael Morgan, who is just about the perfect pick for an Alan Jackson show. Randy Houser will also open select shows, which by the way, if you haven’t checked out his brand new album Magnolia, you’re doing yourself a disservice. Don’t know some or most of these names? That’s part of the fun, discovering someone new, both in the voting process, and by seeing them live on stage opening for Alan Jackson. And don’t boo hoo that your favorite band isn’t included here. These artists were selected in keeping with the spirit of putting Lower Broadway talent that too often goes overlooked to the forefront. What you can be assured of its they’re all COUNTRY. Fans can vote at ajsgoodtimebar.com, and voting will remain open until February 8th. 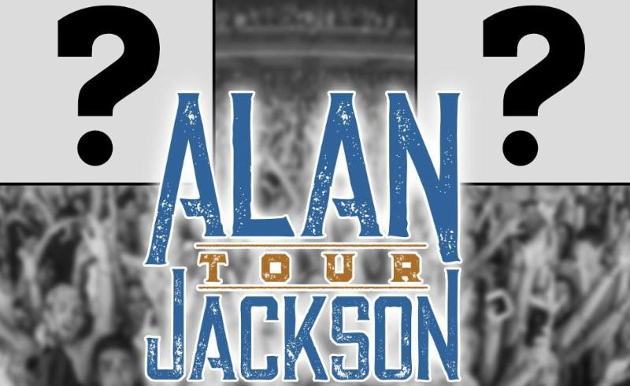 Alan Jackson’s tour dates, and how the openers have shaken out so far are below. Good for AJ. He could pick about anybody he wants for this slot and he’s pulling for little people who work selflessly in the trenches , playing real country music for tips and never getting much recognition. That’s a guy who wants to save country music! This is how it should be done. This guy is one of the greats. here’s another thought . I am a HUGE fan of AJ’s nephew , songwriter Adam Wright . I was and am a HUGE fan of ” The Wrights ” , the country duo Adam and his wife recorded as several years back . this duo would be the the ideal opening act for AJ’s shows and if you aren’t familiar with their music ..CHECK IT OUT ‘Planting Flowers’ , Rewind’, ” Home Sweet Highway “.. etc… GREAT songs. I’m sure the idea of nepotism comes into play in this scenario …but damn ….its AJ . he’s recorded a ton of Adam’s grammy-nominated COUNTRY music and I’m not sure he would get any flack whatsoever about a move like this . showcasing these traditional country talents in these times would be doing country music- and US – as big a favour as it may be doing ” The Wrights “. I have an idea. Call me crazy..but why not showcase an act or band that is from the area the concert date is scheduled? It would require some ‘gumpshun’ on the opening acts part,but as an opening act,that’s whats expected. Just an idea. this is done quite regularly here in Canada when possible . and yes …GREAT way to give exposure to a deserving up and comer locally or even regionally . Kenny Chesney did that about nine years ago on one of his tours. Great exposure for some local acts! Anna LaPrad (or Laprad), Eric Holmgren, Lucas Barela, Mark Box, Martin McDaniel, Sarah Martin & Warren Garrett all have LPs, EPs or singles out. Some released a couple of years ago (like Anna LaPrad or Mark Box) & some with newer stuff like Martin McDaniel (September 2018 – very polished “country” sound) or Sarah Martin (November 2018 – not bad). I think i buy a track or two. Lucas Barela, Mark Box & the Warren Garrett single sound good. Skimmed too fast and read “Vince Neal” and almost cried before rereading it. It seems like a good business move too. He’s showcasing a lot of the talent that plays at his restaurant, so it’s kind of like an ad for AJ’s entertainment. I’m 43 years old. AJ is my favorite artist of all time, just like Hag was my dad’s ( I got Haggard’s auto on a guitar by the way!). Was going to take my 8&11 yr old daughters to see him in Winston-Salem, NC in a few weeks and, even being a member of the fan club which I’ve been for years and years, it would cost us $457.00 for the show. I’m talking $99/ticket on floor and first level. I know the hell that digital downloads have caused, but geez. For the first time ever, I’m gonna miss a show from my fav. But I can take a nice weekend overnight trip for the same price 2 hours of hearing AJ sing costs. I love Alan Jackson’s singing. He is one of the greatest. So if you were a good but undiscovered female country singer, you’d have a better chance opening for Alan Jackson than getting played on country radio. Something’s wrong with this picture. ……..you’d also get a COUNTRY audience who appreciates that you are a COUNTRY singer …. Just imagine if Strait did this, or Nelson, or Haggard, or Stuart. They could save country music. If you want something to grow right, you’ve got to tend the ground it grows in. Stuart brings up and comers, including women on tour with him all of the time. Saw Kelsey Waldon open for him a year or two ago in Minneapolis. Mindy Campbell would be Craig campbell’s Wife. Stage name and YouTube videos can be found under Mindy Ellis. She performs weekly at legends. There are some duets out there too as he shows up sometimes. Recently just performed together at the Rocky Mountain country awards. I think Cody Johnson and Cody Jinks being guests on this tour would be awesome!